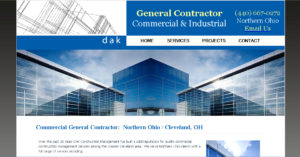 Contractor Web is the leader in Contractor Website Design for General Contractor & General Construction Websites. View our portfolio of contractor businesses across the US who have relied on us for years for their professional web design and Contractor SEO (search engine optimization) needs. Professional websites and SEO are an important mix of a contractor’s marketing strategy – if not the most important! Don’t rely on your sister’s-friend’s-nephew to generate website traffic for your General Contracting business. Consumers use the web more and more every day to find new contractors online, while the yellow pages collect dust and are merely used as booster seats for kids to drop their sloppy joe on.